a book chick: "The Jane Austen Marriage Manual"
"The Jane Austen Marriage Manual"
my take: Pretty much I'm a sucker for anything Jane, and I had Jane on the brain as I perused the book store on vacation … whilst I was tooling around Canada my friend Lucy was taking the waters and sites in Bath at the Jane Austen Festival … wherein folks dress up in period costume and have tea and learn about everyday life in Bath circa Persuasion, et al. I prefer Austen references to be subtle … say, plot structure or a modern interpretation (the movie Clueless from Emma). This kind of clunked one over the head with Jane-ness. The plot is to try to use Pride & Prejudice as a model for getting a man to solve the problem of unemployment in the economic downturn of the 2000's. What I did like was the quotes at the beginning of the chapters. And the characters' names. The author has sold the rights for film and it may make a great movie as it takes place in fabulous places. 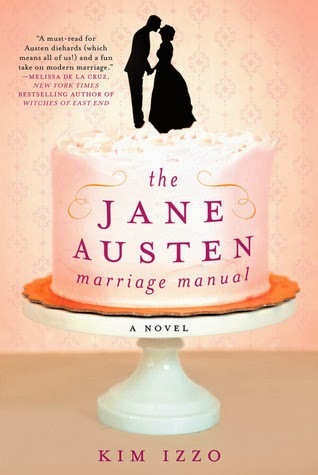 I'd classify this as a beach or escape or frivolous read … if you can't get enough of Jane, stop by and borrow this one.